Learn to make Mango Lassi Recipe | Mango Flavored Yogurt reicpe with an easy Video tutorial. When life gives you mangoes, you make mango lassi — it’s just that simple. 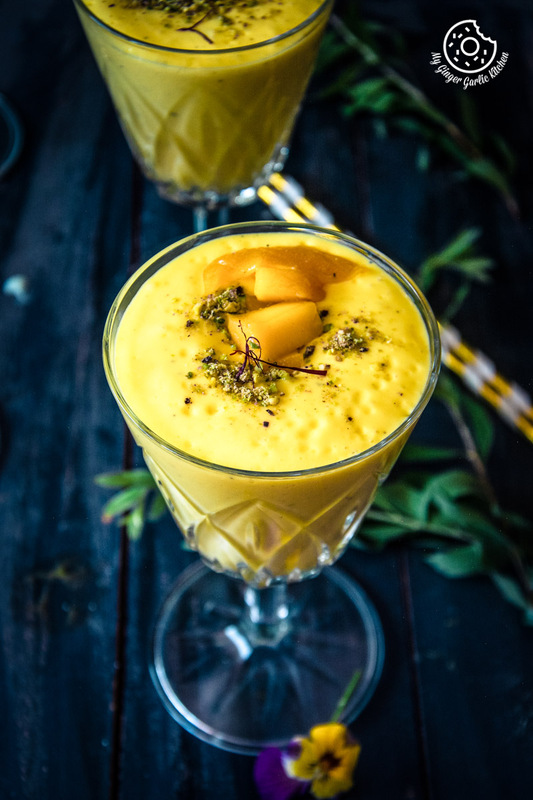 A rich, creamy, dreamy indulgent glass of this chilled and satisfying traditional Indian yogurt mango drink ‘mango lassi’ is a pure bliss on a hot sunny day. 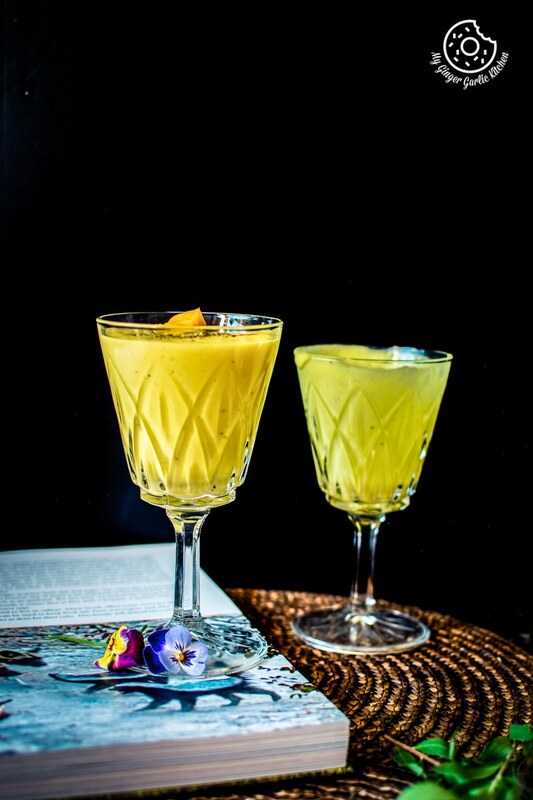 This exotic mango drink cools and replenishes on a hot day while serving as a snack or dessert. Lassi is an utterly delicious cooling yogurt drink, which is popular throughout the Indian subcontinent. A mango lassi is basically a yogurt-based mango milkshake or smoothie. Due to its taste, this is definitely a favored drink at Indian restaurants. There is also readymade lassi available in stores, but you can never get that original taste of freshly blended mangoes in your store-bought sealed bottles. But the good news is that making this lassi is so easy at home. 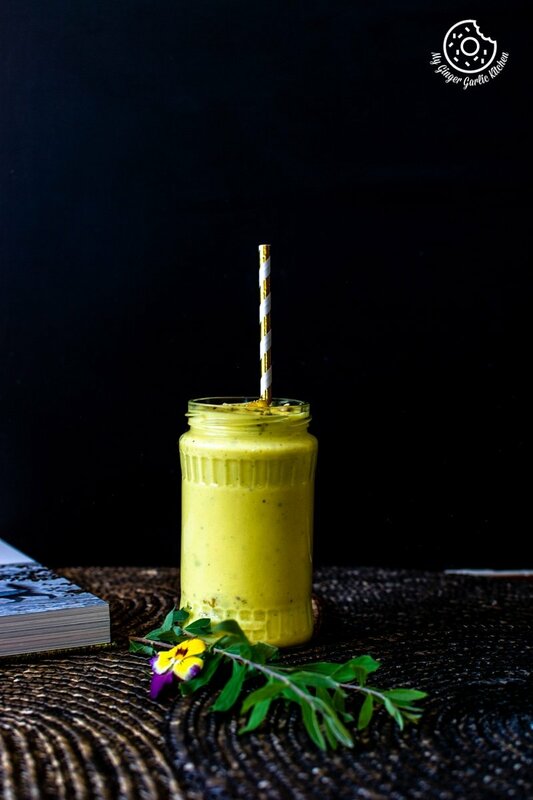 Homemade mango lassi is as revitalizing as the morning dew and probably the most excellent thing for any day when the sun goes hotter. 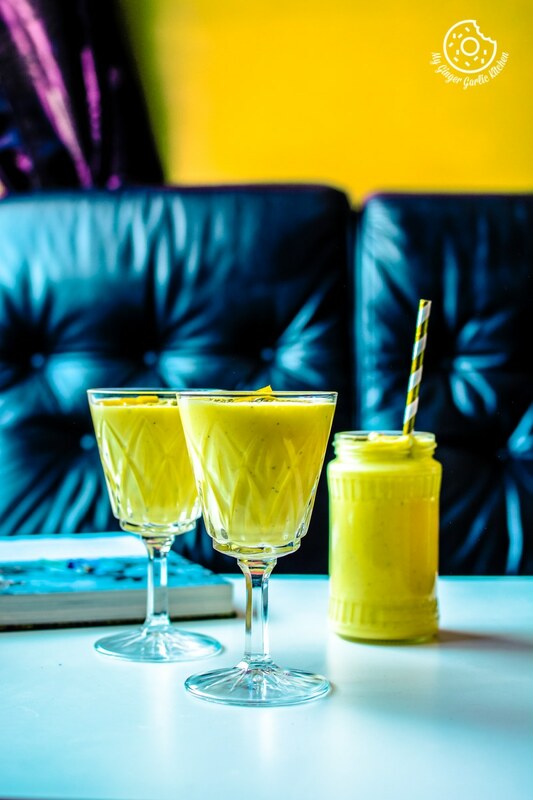 Is mango lassi a drink or a dessert? Technically lassi is a drink which is often served as an after-meal dessert in restaurants. If you ask my personal views, then I would happily put this creamy lassi into a category of desserts rather than a drink. 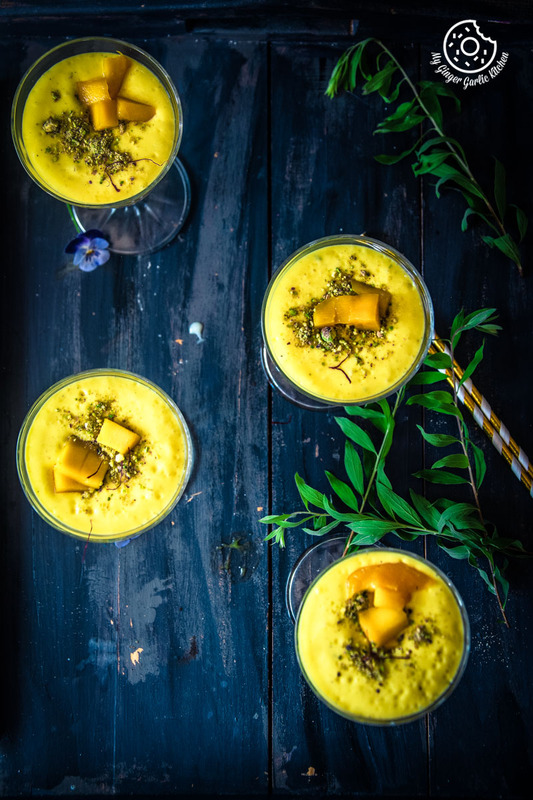 This mango lassi aka ‘aam ki lassi’ could also be served as a full meal on the days when the heat waves are intense, because mango lassi is so filler, refreshing and chilling at the same time. Is it great to drink it after eating some spicy food? Yes, definitely it makes a great soothing drink after eating spicy food. 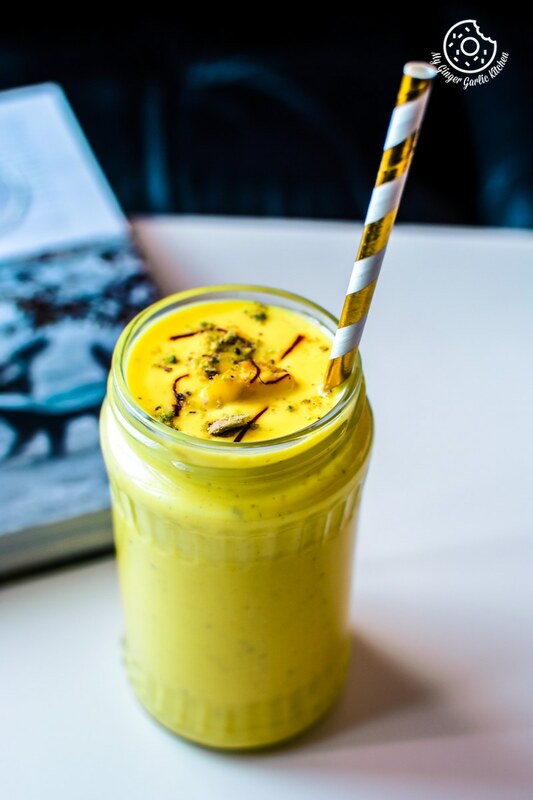 This mango lassi is one of the most refreshing drinks on this planet which goes so well with your favorite spicy curry. 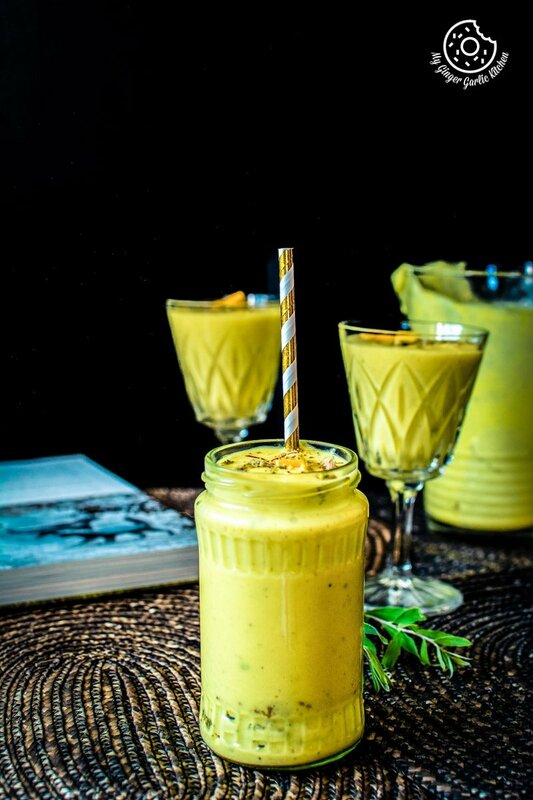 Is it necessary to use mango puree for making this mango lassi? No, it’s not necessary. You can either use fresh or frozen mango chunks, canned mango pulp or canned mangoes. No matter what type of mangoes you are adding, your lassi would always come out delish. If you are using fresh mangoes then just make sure that you use a ripe and sweet mango. Can I swap sugar with honey or maple syrup? Adding sugar is not necessary for mango lassi. It depends on the variety of mangoes you are using for making mango lassi. If the mangoes you are using are natively very sweet such as ‘dasheri aam’, then you can completely avoid any type of sweetener. With other mangoes, you can easily swap sugar with honey or maple syrup. You can also use brown sugar or cane sugar for making mango lassi. The addition of yogurt itself is sufficiently tangy for lassi. But if you are not very sweet toothed and want it tangier, you can also add a dash of freshly squeezed lemon or lime juice. Just avoid the addition of milk in that case. What should be the texture of a perfect mango lassi? 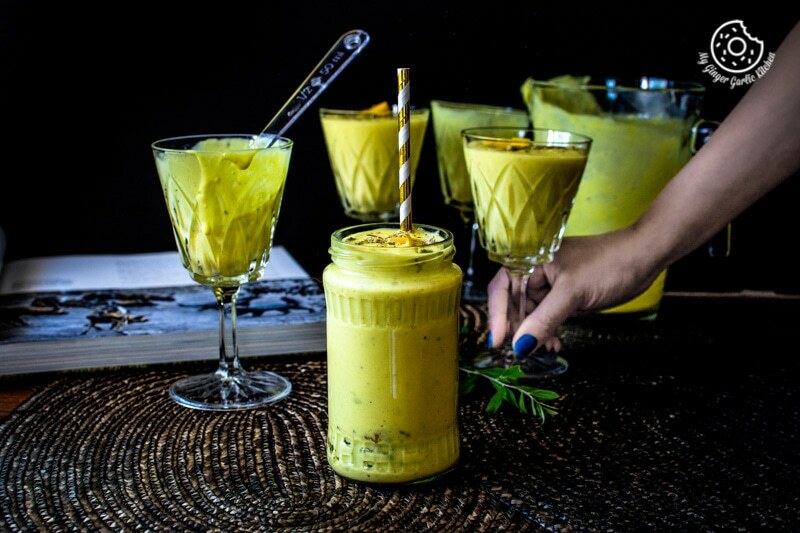 You will find a surprising amount of contrast in mango lassi recipes over the internet. For me, the creamy dairy texture is best for any lassi. It’s the same texture we are looking for in this mango lassi too. Creamy and thick enough drinkable texture is what will make or break your lassi. Traditional lassis are made only with yogurt and crushed ice to get that perfect creamy buttermilk like consistency. Is cardamom flavoring mandatory for lassi? I do love the addition of ground cardamom as a flavoring – it goes wonderfully well with the mango and yogurt. If you just don’t like the cardamom, then you can also add a dash of ground cinnamon. Just don’t use any other flavorings to keep its raw taste. Can I add ice cream to mango lassi? Yes, you can doubtlessly add ice cream to lassi. It would taste outstanding. But if you are looking for that authentic taste, then I will suggest you avoid it, because the addition of ice-cream would surpass the mango flavor. However, if you still want to add ice cream and see how it tastes, then go for mango ice cream, because it tastes best with the mango lassi. It also empowers the mango flavor, thereby increasing its richness. What is the best season to consume mango lassi? Summer is full-on mango season in India when there is an abundance of mangoes. Streets are flooded with vendors carrying the sweet aroma of mangoes, and you could see the sightings of its sweet flesh everywhere. Thus this is a summer drink if you want to consume the goodness of fresh mangoes. But if you are using canned or frozen mangoes then this lassi surely can be consumed throughout the year. How many types of lassi are available and what makes them different from one another? Lassi has two main diverse flavors: sweet and salty. Salty-sour lassi is also known as ‘ plain chaas’. Then there is another one, an utterly refreshing and salty spiced and herby lassi, known as ‘Masala Chaas’. There is also this strawberry chaas which has strawberries and the right amount of spices and herbs which makes it a wonderful fruity and spicy-salty lassi. What is the difference between plain lassi and mango lassi? There are many varieties of sweet lassis. One is sweet, plain lassi which is simply flavored with sugar, which balances the natural sourness of the yogurt. Then there are flavored lassis such as cardamom lassi, saffron lassi, rose lassi and more. Then comes the fruity lassi. Fruity lassis include examples such as orange lassi, strawberry lassi, cherry lassi, blueberry lassi, etc. Fruit lassi is versatile enough to include most of the fruits and berries. You can be really playful here and create your own magical fruit flavored lassi. And if you want a lassi out of the league, then I would recommend you to try this cappuccino lassi and chocolate lassi. What’s the perfect ratio of yogurt and milk to get the best lassi? I have found that the ratio which works for me the best is 2:1. It means adding two parts of yogurt and one part of milk. If you prefer to use greek yogurt or any other thick yogurt which I used, then I would suggest you to add chilled milk to balance the texture and flavor. A lassi made only with Greek variety or another thick yogurt is too thick to drink. And if you add 1:1 yogurt: milk or yogurt: water ratio then it is too thin. Can I use fat-free or low-fat yogurt for making mango lassi? You can surely use low-fat yogurt if you prefer. The 2:1 ratio gives you a mango lassi which is rich and creamy. It is as thick as a good lassi ought to be, and yet just thin enough to glide down with leaving a cooling sensation on the throat. For me the creamier the yogurt, the better. I always prefer using chilled thick yogurt and chilled whole-milk for making lassis. And sometimes I add a couple of ice cubes to make it cooler and slightly thinner. What are your favorites lassis? Learn to make Mango Lassi Recipe with an easy Video tutorial. When life gives you mangoes, you make mango lassi — it’s just that simple. 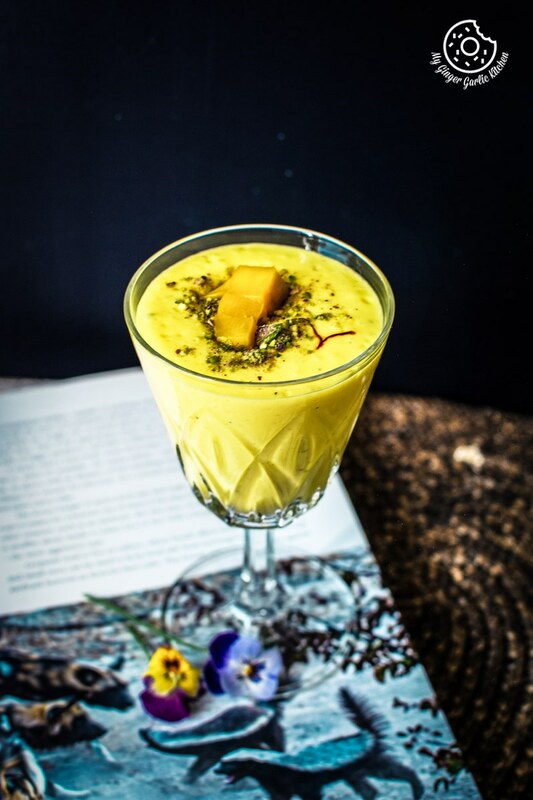 A rich, creamy, dreamy indulgent glass of this chilled and satisfying traditional Indian yogurt mango drink ‘mango lassi’ is a pure bliss on a hot sunny day. This exotic mango drink cools and replenishes on a hot day while serving as a snack or dessert. 1. Put mango puree, yogurt, milk, sugar, and cardamom into a blender and blend for 2 minutes. 2. This lassi is thick. If you want a milkshake consistency, then you can also add some crushed ice to the blender or serve over ice cubes. 3. Transfer into serving glasses and top with some mangoes, and chopped pistachios. 4. Sprinkle with a few saffron strands and a pinch of ground cardamom to serve. 5. Serve immediately or keep it in the refrigerator for 3o minutes.